A "Dog" Craft (or... maybe some other animal...) | Tired, Need Sleep. 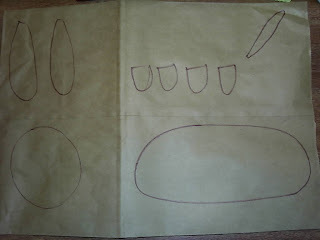 So I asked him, "do you want to make a collage, do you want to paint, or do you want to draw with your markers?" I'm thinking, do I need to get out the glue, paint, what? 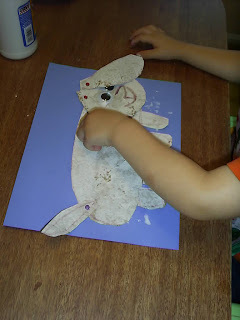 M had a confused look on his face, and said, "No, Mommy, I want to make a DOG!" A dog? Well, that's a bit specific for a tired mama brain on a Saturday morning, isn't it? He normally isn't that specific in his art requests. Maybe we are entering the "crafty project" stage. Anyway, the wheels slowly started turning in my head, and I came up with something that made him happy, but doesn't really look like any dog I've ever known. I'm not sure what it is. Anyway, it was fun, and that is what counts, right? 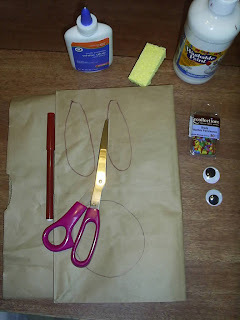 paper bag, marker, scissors, paint in the color of your child's choice, something to paint with (we used a sponge), 2 googley eyes, glue, and 3 brads (if you want moving parts, and, honestly, who doesn't?). 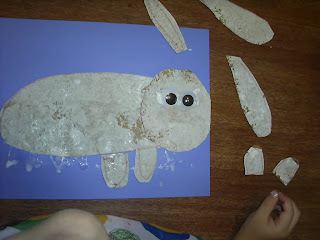 You'll also need a piece of cardstock or some heavy paper to glue the "dog" to. 2. Paint the dog parts with color of choice. M chose white. White didn't really go with the weiner type dog I had in my mind's eye and had already drawn on the paper bag; I was thinking more along the lines of brown, but he was not to be swayed. He knew what he wanted. 3. After the paint dries, cut out your pieces. 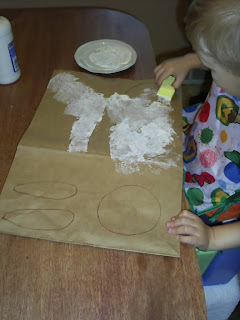 The nice thing about painting on paper bags is that the paint soaks in and dries fairly quickly. You'll appreciate this if you have a child who is as impatient as mine is. 4. 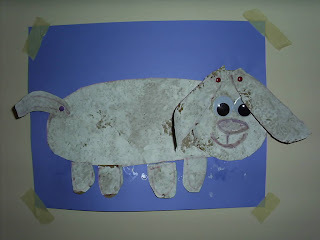 Glue the body of the dog onto your cardstock paper, then glue on the head, eyes, and feet as well. 7. Use your marker to draw the nose and mouth. If you are a better artist than me (and you probably are) you could draw the head of the dog a little differently instead of using a plain old circle, and it might actually look like a dog when you are done! Imagine! 8. Tape it up and let your child "wag" the dog's tail and flop his ears around. What fun!